Following an agreement with the U.S. internet store eBay, Russian Post is to slash delivery times for parcels posted from China to Russia, with plans to expand its ePacket initiative to deliveries from other countries. Russian Post (Pochta Rossii) and internet store eBay are to join forces with the aim of improving the quality of service for customers.On July 23, 2014, the two companies launched a joint project, ePacket. Russian Post's press service told RIR that the project is aimed at improving delivery times for eBay-bought goods to Russia from abroad. In particular, the project envisages the integration of the two companies’ information systems to improve the quality of delivery and tracking. The sides have decided to start their joint work with Beijing, with delivery times for goods posted from China to Russia to be cut from 30 to nine days. Later, the plan is to extend this experiment to other countries. Furthermore, eBay can now be used for deliveries inside Russia too. Experts point out that previously some sellers, when describing their goods on eBay, would add that they could not provide deliveries to Russia, among other things, because of difficulties with tracking and associated instances of fraud. For example, a buyer, having received a parcel, could claim that Russian Post had failed to deliver it and demand their money back. There was practically no way for the seller to verify whether it was true or not in a case like this. "Logistical problems, caused by lengthy delivery times and problems with tracking, generated pressure on the market," Investcafe analyst Timur Nigmatullin points out. As part of the new deal, the two companies' programmers have established data exchange within the existing systems, meaning ePacket required practically no investment, according to Russian Post. "Our priority is to ensure the announced delivery times… Then Russian Post will manage to restore its reputation as a reliable partner," the company's managing director Dmitry Strashnov said at the signing of the agreement. In recent months, Russian Post has come under severe domestic criticism. In November 2013, Prime Minister Dmitry Medvedev said that the company was in a difficult situation. "People wait for their parcels, letters and other post for months. Sometimes things look absolutely horrid as parcels and correspondence are just dumped somewhere and never get delivered," he said. Medvedev added that only a quarter of Russia's population used Russian Post services, while the other three-quarters tried to avoid it. At the same time, Russian Post remains the only company in the country providing universal postal services at rates regulated by the state. It has 42,000 branches across the country and is a monopoly in some regions. According to the company itself, over 2.5 million people use its services every year. In the second quarter of 2014, eBay published a financial report warning investors of possible business risks associated with the Russian-Ukrainian crisis. 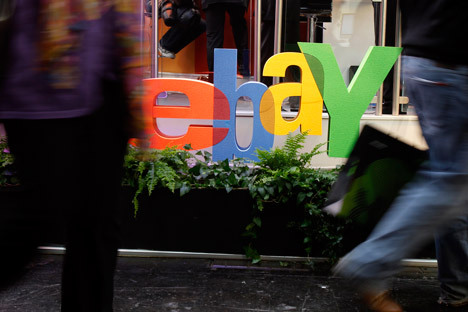 Analysts feared that in response to the U.S. sanctions, the Russian authorities may make operations with eBay more difficult, but those fears proved unjustified. Additionally, on July 24, 2014, the Russian Finance Ministry gave up its plan to draft a document restricting duty-free delivery of parcels into Russia to 150 euros ($200) - the current threshold is 1,000 euros). According to eBay, Russian users place an average 90,000 orders a day, most of them going to sellers in China, the U.S., Germany, and the UK, Russian news agency RBK reports. According to Russian Post, in 2013, China accounted for 60 percent of the 28 million parcels with goods from abroad. In 2014, the latter figure may grow by 150 percent to approximately 70 million, and is then predicted to double every year. According to Anna Mishutina, an analyst with FINAM investment company, following this agreement, it would be logical to expect a rise in the number of purchases Russians make on eBay and an overall increase in cross-border trade. "Every year, internet shopping in Russia reaches record high numbers of active buyers and volume of trade, with most deliveries coming from China,” says head of research at RUSS-INVEST investment company Dmitry Bedenkov. “At the moment, the average delivery time from that country is about three weeks. As part of this agreement, it is expected to be brought down to nine days, which will boost trade between the two countries even further." Overall, macroeconomic research analyst with UFS IC Vasily Ukharsky points out, this is a considerable step in the right direction, especially in light of growing speculation that Russia may introduce tougher internet shopping regulations. "If internet giants such as Amazon or eBay refuse to trade with Russia, our country will lose a lot," he concludes.